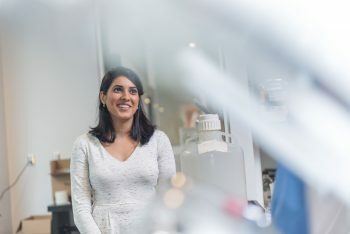 Amani Saini, BA’09, wants to establish routine genetic tests in Canada to combat one of the country’s leading, but little recognized, causes of death. And for her, it’s personal. It happened in the fall of 2010, when students at UBC were writing their midterms. Amani Saini’s younger sister, a 19‑year‑old studying anthropology, called her family’s home in Abbotsford and asked her parents to come and pick her up. She wasn’t feeling well. Saini knew her sister wouldn’t miss exams unless she had been stricken with something particularly nasty, but she could not have anticipated the rapid and severe worsening of symptoms a short time later that would lead to a surreal and terrifying vigil at Vancouver General Hospital’s ICU, praying for her little sister’s life. Courtesy of the University of British Columbia Sequencing Centre at Pharmaceutical Sciences. Saini’s sister was suffering from toxic epidermal necrolysis. It caused her eyes to burn, her body to blister, and her skin to peel off. A doctor told the family to prepare for a funeral, says Saini, still shaken by the memory. Almost as shocking as the symptoms and dire diagnosis was the cause: an adverse drug reaction to the ibuprofen in a common over‑the‑counter medication she had taken to treat an ordinary cold. Miraculously, after three weeks in hospital, Saini’s sister survived, although her quality of life would not be the same. Saini, too, was profoundly affected. How could a non‑prescription cold medication lead to a life‑and‑death struggle? The doctors told her they didn’t know how it might have been avoided, says Saini, who couldn’t let the issue go. Now she is on a mission to prevent adverse drug reactions (ADRs) like the one that nearly killed her sister. ADRs, which occur when patients experience a harmful and unintended reaction to a normal dosage of a drug, kill 10,000 to 22,000 Canadians each year. It’s a number that would place them anywhere between the third and fifth leading cause of death in Canada, if they were recorded in the Canadian Vital Statistics Death Database. But too often, experts say, it’s the result of an ADR, such as toxic epidermal necrolysis (TEN), that is recorded as the cause of death, rather than the ADR itself. But now, dramatic drops in the cost of genetic testing, along with research focused on pinpointing ADRs influenced by an individual’s genetic makeup, stand to change that unsettling statistic. Saini is working closely with researchers at UBC and plans to play a central role by building an organization to advocate for policies to prevent ADRs and help those who fall victim to them. Saini, an arts grad who had shied away from science for years, began reading up on ADRs and possible treatments. She was spurred by anger about the decreased quality of life experienced by her sister, who took a semester off from UBC after most of her tear ducts were destroyed by TEN and still suffers from chronic dry eye. She must spend half an hour each morning caring for her eyes, limit her time in front of computer screens, and use pricey eye drops every day. Her story is not unusual. Hundreds of thousands of Canadians experience ADRs each year. The majority survive, but many suffer lasting damage to their bodies. No one knows how big the problem is. Healthcare providers can report ADRs to a national database, but experts say it’s currently drastically underused. For example, only four per cent of TEN cases are reported there, according to a 2004 study from the University of Toronto. New legislation enacted in 2014 – Protecting Canadians from Unsafe Drugs Act (Vanessa’s Law) – requires mandatory ADR reporting by healthcare institutions, but this will not be enforced until supporting regulations are published. In BC alone, hospital emergency departments treat about 210,000 patients for ADRs each year, according to 2011 research from UBC. In 2015, another UBC study found that one in 12 visits made by children to a pediatric hospital in Nova Scotia was related to problems with medications, including ADRs. Such hospital visits, many of which are preventable, come with a significant price tag: ADRs cost the Canadian healthcare system more than $13 billion each year. Hundreds of thousands of Canadians experience adverse drug reactions each year. The majority survive, but many suffer lasting damage to their bodies. Other countries are already taking advantage of new research and cheaper DNA sequencing. In Taiwan, eight per cent of the population carry a gene variant that can trigger TEN when they take certain drugs. Genes that trigger TEN are also common among Southeast Asians and Indians. (Saini’s parents migrated to the Lower Mainland from Punjab, a province in Northwest India.) Over the last decade, doctors in Taiwan, Thailand and Singapore have begun routinely testing patients for these gene variants before prescribing specific drugs that are known to cause TEN in those countries. Their stories fired Saini up. In late 2015, she contacted researchers who studied ADRs in Southeast Asia to find out more. “That’s when I realized this is something that can be adopted here,” recalls Saini, a politics nerd who has been dedicating her spare time to human rights causes, such as genocide prevention and landmines control, since her teen years. She soon met researchers in Vancouver who were already building the knowledge needed to prevent ADRs in Canada. They were based in the same place where her sister’s brush with TEN began – at UBC. In fact, medical professionals, geneticists and policymakers in BC have the potential to take a leadership role when it comes to preventing ADRs, according to Neil Shear, a Toronto dermatologist who was the founding chair of the federal government’s Canadian Adverse Drug Reaction Advisory Committee. 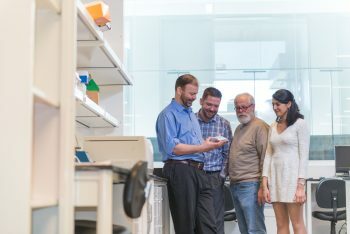 More than a decade ago, scientists and doctors affiliated with UBC, including Bruce Carleton, Michael Hayden, and UBC geneticist Colin Ross, BSc’93, spearheaded the Canadian Pharmacogenomics Network for Drug Safety (CPNDS), a group of clinicians and researchers across Canada that aims to reduce serious ADRs in children. The network has made significant headway, identifying cancer drugs that can cause deafness and heart problems among children with specific gene variants. They also discovered that codeine, a common painkiller, can be life‑threatening for breastfed babies if their mothers metabolize it too quickly. ADRs are “a bigger problem than most people realize,” says Ross, who has focused his career on using genomics to improve the safety and efficacy of drugs. He developed the first gene therapy to receive regulatory approval in the Western world during his postdoctoral fellowship at UBC. Over the years, the network has gathered DNA samples from more than 40,000 patients. They include those who haven’t, as well as those who have, had ADRs involving specific drugs. Most studies require anywhere between 50 and 1,000 willing patients. Volume and in‑depth clinical data are key. Researchers run tests on their DNA samples to identify genetic factors that might be linked to particular ADRs. Typically, they try to replicate the results with a second, and sometimes a third, cohort of patients before following up with validation studies using cultured cells or animal models, explains Ross. To date, genetic tests in Canada have largely been applied to personalize cancer and HIV therapies. Pharmacist and UBC researcher Mark Kunzli, BSc Pharm’07, MBA’11, would like to see the use of genomics expanded to more common drugs. He speaks passionately about the role of community pharmacists. Working closely with Ronald Reid, a UBC pharmaceutical sciences professor, and others at UBC, Kunzli tested a model for how pharmacists could use information from genetic tests to help with medical prescriptions in more than 30 community pharmacies across BC. One day, the researchers hope, doctors and pharmacists will have a database containing the genetic information of patients they can use to personalize treatment plans and reduce ADRs. ADRs are caused by any number of drugs and influenced by many factors, including age, genetics, and how someone’s kidney and liver function. They can also range in severity – from an itchy nose to death. Preventing ADRs on a broad scale is a complex challenge, in part because they are so varied. Even though, as Kunzli points out, “there are certain situations where we know with almost absolute certainty that if you have a certain gene variant and you take a certain medication at any dose, you will have an ADR,” (which is the case with Asians who have specific gene variants that trigger TEN), generally speaking, ADRs are caused by any number of drugs and influenced by many factors, including age, genetics, and how someone’s kidney and liver function. They can also range in severity – from an itchy nose to death. Martin Dawes, head of UBC’s Department of Family Practice, is working on a practical tool to guide pharmacists and physicians through the process. He helps run a personalized medicine company partly owned by UBC called GenXys, which runs pharmacogenetic tests on DNA samples of customers and supplies software that helps patients and physicians make sense of the results. “The real future is where you’ve got it on your smartphone,” said Dawes, envisaging the day when our genetic information is loaded into an app that helps us make decisions about over‑the‑counter medication. This is what Saini brings to the table. She holds a master’s degree in public administration from Dalhousie University and has worked on health policy for two provincial governments. Last year, she wrote a policy proposal that called on provinces to test Canadians for gene variants that could trigger ADRs, either when they are born or when they are prescribed a new drug. In addition to saving lives, Saini argues that genetic tests to prevent ADRs would save the healthcare system billions of dollars and ease the rush in emergency rooms. 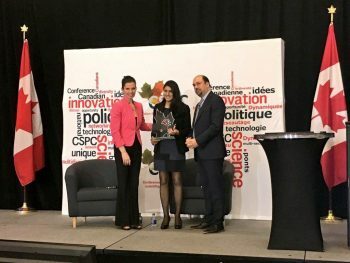 In November 2016, the Canadian Science Policy Centre recognized her idea with the Science Policy Award of Excellence in the youth category, which recognizes “innovative and compelling evidence‑based policy that will make a difference to Canadians” by those under 35. Now, with advice and support from Dawes, Kunzli, Reid and Ross, Saini is establishing a non‑profit organization dedicated to preventing ADRs. In addition to advocating for targeted genetic testing, Saini plans to push for electronic health records to give healthcare providers clear information on a patient’s allergies and gene variants, and support a mandatory national system for gathering data on ADRs. “If the evidence isn’t there, you can’t really act upon it,” she explains. Even everyday interactions with her sister – like a recent Friday night when she couldn’t sleep over at Saini’s because she’d left her eye drops at home – are a constant reminder of just how important this evidence can be.